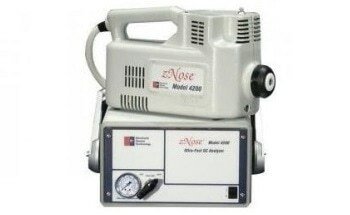 The Model 4300 Portable battery operated zNose® is rechargeable with ultra-fast gas chromatography capabilities. 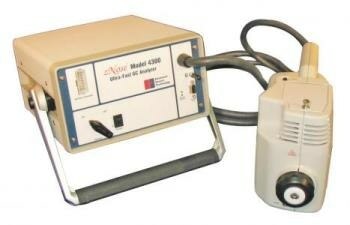 All types of vapors are detected and analyzed by this device. Traces of chemical, biological and organic compounds are identified by this portable electronic nose analyzer in a rapid and accurate manner. Automatic identification of compounds takes place with the help of an external computer and Electronic Sensor Technology’s proprietary software, Microsense. As a powerful odor detector, the 4300 Portable zNose® offers efficient, accurate and portable analysis. 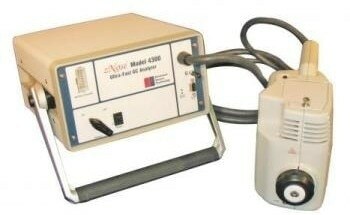 The Model 4300 is capable of analyzing vapors in a minute with parts-per-billion sensitivity. 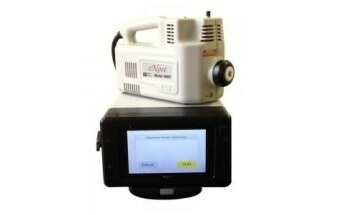 It is available with an internal refillable helium cylinder and can adapt to use disposable helium cylinders. The lithium ion battery used in this model is rechargeable and typically lasts for 5 to 6 hours. This model has been approved by the U.S government. Homeland Security threats are prevented by detecting chemical vapors and odors produced by explosives, biological, and chemical weapons. The best in class ultra-fast gas chromatography and surface acoustic wave technologies are employed by zNose®. The application of zNose® involves a simple 3-step procedure that quantifies all odor types within a minute with speed, precision and accuracy.